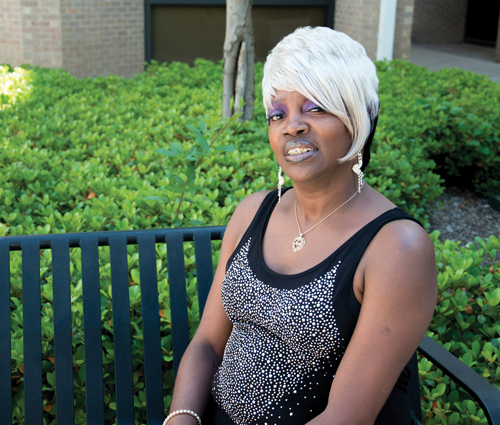 Charlesetta Garrett decided to take control of her life after battling a life of drug use and prostitution. Now she wants to counsel others who face the same challenges. Photo by Ana Gallegos/The Et Cetera. She unfolds a paper bearing mug shots dating back to February 2002. The mug shots show the battle of a woman in the midst of an addiction to crack. Substance abuse counseling major Charlesetta Garrett keeps copies of this paper with her everywhere she goes. It is a reminder of how much she has overcome and is a tool to reach those who still fight the affliction of drug addiction. Garrett said her drug-driven criminal life began in 1987 as a prostitute and ended with her arrest in 2009. Garrett has been incarcerated three times for non-violent crimes. Addiction to crack motivated Garrett for more than 20 years, she said. She hit rock bottom several times but was unable to maintain sobriety. Garrett grew up in Oak Cliff, living there for almost 50 years. She is the youngest of four with two sisters and a brother. They all have addictions of their own, she said. One of her sisters passed away due to congestive heart failure related to her drug use. After her parents divorced, Garrett felt an emptiness that grew too painful to bear. Garrett said that after the divorce, her father’s visits became less frequent. By the age of 26, the unshakable feeling of abandonment is what led to her becoming a prostitute, Garrett said. During this period of addiction and crime, Garrett gave legal guardianship of her two daughters to her mother. Last semester Garrett took a speech class taught by Professor Nicholas Vera. One project he assigns students is a personal narrative speech. Garrett’s personal speech covered her battle with addiction. For another assignment Vera said Garrett delivered an “impactful” speech on the reality of individuals whose addiction has led them to a life on the streets. “She owed money to all kinds of seedy people on the streets and there were people that threatened her life,” Vera said. Things turned around for Garrett after she went through a Dallas County rehabilitation program called STAR court. According to the court’s website, the program takes people convicted of felony prostitution and places them in a treatment facility. Garrett successfully completed the program at the Phoenix House in Wilmer, Texas. The program provided Garrett with strategies to assist her in her new life. “You are taught coping skills, different types of things to avoid using drugs and alcohol or committing the same crime,” Garrett said. Garrett created her mission while at Phoenix House. “I decided while I was in rehab to help others, to give them what was freely given to me to help save my life,” she said. Along with this change in philosophy Garrett decided in 2013 to go to school to become a substance abuse counselor. Garrett works at her sobriety on a daily basis by taking part in church-sponsored programs such as Overcomers, which she said is similar to a 12-step group. In addition, she is a sponsor for several individuals in a 12-step program for narcotics. Garrett also makes use of her experience by volunteering at ABC Behavioral Health and Nexus Recovery Center. Garrett recently obtained employment at a transitional house, which has provided her with income to move into her own place. “I was in a housing program at ABC Behavioral Health for five years,” she said. “I just recently was able to move out on my own. Garrett’s transformation has had a positive impact on those who are close to her. Garrett is now a doting grandmother of six as she works towards her degree. I have known Charlesetta since 2009. She is bright, fun, and loving. I don’t know anything about the person she was before not that it makes any difference. She has enriched my life in ways she has no clue of. Her heart is solid gold, her eyes are full of light but what I like most about her is her fight! I have known Charlesetta since Jr High she has always have been a beautiful and talented lady. I am so proud of her.I now know who I can lean on she can lean on me…. Love you and proud to say to the World “that’s my classmate”!!!! Beautiful ,makes my heart jump.This story remind me of Joseph, one can go from the pit,to prison,and finally the Palace.Keep your faith Charlesetta. I have known this woman almost all my life, grew up together, went to school together. I have seen her as a good person, then at her bad times, now back to her best. Nothing but blessing showing upon her now. What a blessing to meet someone who wants to, and has a positive experience on the lives of people that God has placed in her path. Keep on giving back and encouraging others. I thank God for changing you for the best.